her mother in "The Wave of the Sea-Wolf"
The Brattleboro Museum & Art Center celebrated its 30th year in the Union Station location at 10 Vernon Street in 2002. A group of concerned and committed residents rescued the building from demolition in 1972 and transformed it into a community art center and history museum. In recent years, the Museum has focused on changing exhibitions of contemporary art and on its educational programs. A wide range of work from artists who work locally as well as internationally is exhibited each season from May through December, with some shows changing in September. A unifying theme is chosen each year around which exhibits and programs are planned. Spirit & Vision unites the eight exhibits presented in 2003. Three of the current exhibits are highlighted in this article, along with a glimpse into the history of BMAC and some of the perceptions of students who visited this spring. "It looks like rain, paused," reflects an elementary school student as she looks at Lenore Tawney's Cloud Series V (1978), hung under the skylight at the Brattleboro Museum & Art Center. Indeed, this work of art -- made of ungessoed canvas painted with blue squares, from which hundreds of long, knotted strings fall in a regular cascade -- does evoke such poetic response. On another day, in a small room off of the main gallery, a class sits in a semicircle around Tawney's In Utero (1985). With two teachers and a BMAC docent, the children look up quizzically at a child-sized wooden chair hanging above them. A translucent-pink, silken enclosure surrounds the chair. The students wonder at how the artwork is suspended from the ceiling. They examine the shadows on the wall, created by lights that illuminate the piece. "I see a wolf's head in the part that is the shadow of the chair," exclaims one child. "It seems like someone is missing," says another. Visions in Time is a selection of fifty pieces that were created during a span of forty-one years. Christine R. Holderness, curator of the exhibit, has written that it "was conceived to provide glimpses of a spirit and traces of a soul engaged in an on-going journey, whose path strives to connect multiple layers of experience and, in the process, to make the invisible more visible." "Words, pages from books, ongoing personal journals, her own handwriting, and an active intellectual life are particularly evident in many of Tawney's collages and assemblages. The words -- often cryptic, in foreign languages, taken from rare old manuscripts, reduced to a segment or a line -- are visual and conceptual fibers that connect and that serve as a human and historical presence." Lenore Tawney: Visions in Time is on view at BMAC until August 31. - White cups and clear drinking glasses stacked neatly on whitewashed wooden shelves. - Hilly, mowed hayfields with weathered, cedar posts trailing barbed wire like spider's silk across a treeless expanse. - A woman of some years, holding a hen in her large-knuckled hands, peers kindly with a closed smile from behind the hexagonal cells of chicken wire. "I kept returning to the familiar. Or that with which I thought I was familiar. My spirit seems to bring me back to express feelings about place, memories, things that are very intangible. The importance and impact of the land, rural identity, and why people never leave -- this plays out in my work for the last thirty years." Granite & Cedar, on exhibit through December 31, 2003, is a travelling exhibition produced by the Vermont Folklife Center and made possible in part by grants from the Vermont Arts Council and the Vermont Community Foundation. For the 2003 season, the upper part of the white walls in the former ticket office of Union Station is hung with masks from Pacific Northwest and Inuit Indian tribes. From larger-than-life-size to miniatures, these masks from the collection of local resident Steve Bellstrom are made of indigenous materials: Western Red Cedar or whalebone, and some are enhanced with human or horse hair, feathers or painted with acrylic paint in traditional designs to represent spiritual connections with natural beings and mysterious forces. Under the masks is a very different exhibit -- five of the original illustrations for David Wisniewski's children's book The Wave of the Sea-Wolf. The first of these vibrant, cut-paper reliefs depicts a battered war canoe wedged between the limbs of a towering cedar in a Northwest Coast Rainforest. Wisniewski's dramatic, fictional story is about how this came to be, and brings to life the culture of the Tlingit people at the time of first contact with Europeans. Myths of Native America also offers a range of Native American traditional stories in books for all ages, wooden puzzle masks, unique games and a large felt board on which to create a picture-story. This exhibit is sponsored by the Christian Johnson Foundation. The Museum gallery is open Tuesday-Sunday from 12 to 6 through August 31 and reopens with new exhibits on September 13 through December 31, 2003. The Museum Shop offers excellent books related to the exhibits, plus general art books and local artist cards. BMAC offers many events and programs for all ages. Visits for preschools and home daycare providers, schools from elementary through high school, home-schools, seniors and other interested groups are welcome Monday-Saturday with preregistration through the Education Program Coordinator. Docent-led tours use Visual Thinking Strategies, an inquiry-based approach to looking at and discussing art. Various educational series are available: family workshops and presentations; year-round, evening lectures; musical events and Twilight Wanderings. 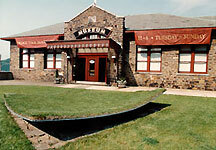 For more information, visit the Museum's website at brattleboromuseum.org or call (802) 257-0124. EDITOR'S NOTE: In addition to the exhibits described above, this season at the Brattleboro Museum & Art Center includes an exhibit by master drystone waller Dan Snow entitled "In the Future of an Imagined Past." A separate article about Snow and his exhibit is found at this link.